The ISEE Research Saturday Demonstration Labs were established in Spring 2015 and are a venue for innovating new curriculum and teaching strategies at UCSC. The venue was conceptualized alongside a grant from the Howard Hughes Medical Institute (#52008112; PI: Paul Koch), which aims to transform introductory science courses in biology, chemistry, and physics, and is further supported by funds directly from UC Santa Cruz. Research Saturday extends beyond biology, chemistry, and physics, to support any science and engineering courses on campus. 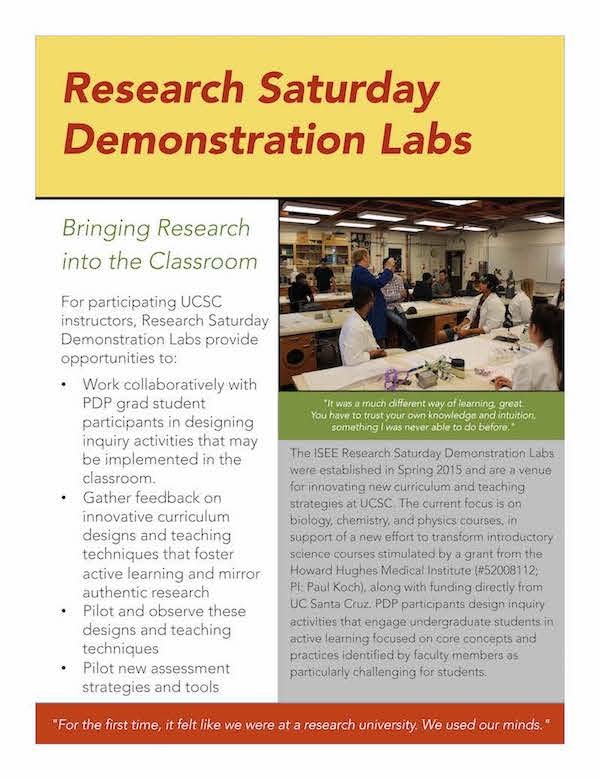 The goal of Research Saturday is to support curricular change at UCSC by enabling PDP teams to design and teach inquiry demonstration labs with the guidance and support of UCSC faculty who aim to bring inquiry and STEM practices into their classroom. PDP participants design inquiry activities that engage undergraduate students in active learning focused on core concepts and practices identified by faculty members as particularly challenging for students. These activities are piloted with UCSC undergraduate students in an informal setting where they engage in collaboration and critical research and design skills, while integrating themselves further into the UCSC STEM community through interactions with graduate students, and hearing about research from faculty. A meiosis activity (relevant to Biology 20A) engaged students in investigating abnormal karyotypes by modeling meiosis and constructing explanations of where abnormalities occurred, supported by evidence from their models. A water transport activity (relevant to Biology 20B) engaged students in investigations about plant guard cells, marine iguanas, and kangaroo rat kidneys through modeling passive and active water transport and working with evidence statements drawn from the literature. "It was a much different way of learning, great. You have to trust your own knowledge and intuition, something I was never able to do before." "Using info to create my own model was more science than lectures or pre-made labs." "We had to work together, we each had our own strengths, we found a way to bring out what we know." "For the first time, it felt like we were at a research university. We used our minds."